Maine Maritime Museum (MMM) seeks a motivated and dedicated Interpretation Intern for the summer 2019 season. MMM is an independent, nonprofit institution dedicated to promoting an understanding and appreciation of Maine’s maritime heritage and culture through gallery exhibits, an historic shipyard, educational programs, a research Library, and narrated excursions along area waterways. Founded in 1962, the Museum is located on a beautiful 20-acre campus on the banks of the Kennebec River in Bath, “The City of Ships”, and provides a unique experience to visitors of all ages from around the world. Our collection features over 20,000 objects, including paintings, sculpture, maritime artifacts and ephemera. The Interpretation Intern will assist the Manager of Interpretation in facilitating in-gallery programming and developing/ implementing visitor feedback assessments. Responsibilities include assisting with the museum’s new family summer program, Seabase Delta: Aquanauts Academy. This immersive, hands-on program lets visitors of all ages explore diving history and technology through games and collaborative learning. Responsibilities will also include but are not limited to managing visitor feedback interviews and surveys and assisting with the daily operations of the Public Programs Department. The ideal candidate will have an interest in innovative museum interpretation and working with the public. This internship is ideal for those wanting a hands-on experience in museum education and will serve as a comprehensive introduction to museum and non-profit operations. The intern will attend staff meetings, participate in program implementation and evaluation, and have the opportunity to meet and work with staff across all museum departments. Under the supervision of the Manager of Interpretation, the intern will have the opportunity to gain valuable experience assisting with and leading innovative and creative public programs. Over the course of the internship, the intern will build skills valued by employers, such as practical experience in museum education, program design and management, collaborative problem-solving, and effective communication. A maritime knowledge or background is not required. The museum welcomes students with career interests in Museums, History, Public History, Art History, Education, Maritime Studies, Environmental Studies and Sciences, Communications, Non-Profits, and/or Tourism and Hospitality. • This is a temporary and unpaid position. To apply, send resume and cover letter by May 1st, 2019 to Sarah Timm at timm@maritimeme.org. I am an Education and Outreach Coordinator with the Girl Scouts of Maine. The Girl Scouts of Maine is looking for students throughout Maine to provide young girls with the experience of being citizen scientists at a Girl Scout of Maine event. An event this year, we have been working to have organizations run activities that correlate to Girl Scout badges. One connection that we have is related to the badge “Think Like a Citizen Scientist”. Girl Scouts of Maine thought that perhaps a local college would be willing to send students to run an activity related to any citizen science projects they have worked on, and could teach girls how this is useful in the scientific field. This would be great exposure for your school and help your students with a skill such as creating lessons. Not to mention your students would get to spend a day in Freeport, ME. Please let me know if you have any students who are interested in inspiring young women and any questions you may have. Are you looking for novel and hands-on ways to teach and learn about sustainable development in today’s globalized world? Volunteer Kaua’i is here to connect college programs, groups, and students to authentic and educational volunteer opportunities on the island of Kauai. As a representative of community-based 501(c)(3) org, Malama Kaua’i, and the coordinator of the program, I’m writing to share with you why and how to arrange your educational opportunities on Kaua’i. Why Kaua’i? Our island is the westernmost county of the U.S., and most remote of the Hawaiian islands, making it an ideal location to learn about the global effects of westernization without requiring a passport. Its unique post-colonial context opens student’s eyes to the past, present and future of globalization and gentrification. Meanwhile, the land-based indigenous Hawaiian culture demonstrates progressive resistance and alternative modes of development. Also known as “The Garden Isle,” and home to complex ecosystems, Kaua’i boasts numerous opportunities to study conservation and sustainability outdoors – not to mention the recreational possibilities. We collaborate with college programs and groups to develop tailored ‘volunteer vacations.’ that match you’re interests. For example, we hosted an interdisciplinary group of Virginia Tech students and connected them with the resources to build a shed for a garden education at a local Hawaiian immersion school. We arrange internships and host student researches in a variety of fields as well – over the summer we hosted interns from Duke University, University of South Florida, University of Virginia, and more. For students of the environment, public policy, development, health and more, gaining a perspective beyond one’s own community is integral to a well-rounded education. If you want to integrate beautiful and unique Kaua’i into your academic experience, please do not hesitate to visit our website and/or contact me directly at volunteer@malamakauai.org or (808) 828-0685 x11. WindowDressers Brunswick Community Workshop all week, where we are putting together about 270 insulating window inserts. We just had a cancellation of a group of 6 volunteers who were to help us put the inserts together this Tuesday. About 40% of the inserts are going free of charge to Brunswick area folks who struggle to make ends meet, and we’d love to get Bowdoin students involved in future years. Our Tuesday shifts run 8-12 in the morning and1-5 in the afternoon. Even if students can only come for part of a shift, they would be most welcome. Same is true on Thursday and Friday, where we are a bit shorthanded. And we could use up to 7 people on Thursday evening, perhaps a more convenient time for students. The workshop is taking place at St. Paul’s Episcopal Church at the corner of Pleasant and Union (entrance on the Union St. side). We teach people their tasks on the spot. It’s easy and fun! I don’t know if you might have a way of getting the word out, but if you can, it would be great. We have to finish all 270 inserts by the end of the day Saturday, when our equipment has to be returned for the next community build of inserts somewhere else. Please use my cell number below if I can answer any questions you might have. Description: The National Weather Service in Gray, Maine seeks motivated students that desire to learn more about the operations in a local weather service office. In this internship, students will learn many aspects of the day-to-day operations of the office, including warning operations and forecast creation. In addition, students will have the opportunity to participate in office research and outreach. This will give students the opportunity to determine whether a career with the National Weather Service may be right for them. Length of Internship: Averages two to three days per week (~10-20 hours) starting in the second half of May and continuing through early August. This is an unpaid internship. Eligibility: At least a half-time student pursuing a degree in meteorology or atmospheric science that has (by this summer) completed their sophomore or junior year. What we need from you: A cover letter stating your interest in the internship and why we should select you. In addition, please send your resume that includes the coursework you have completed and any related experience. Finally, please include a copy of your most recent transcript. Unofficial transcripts are acceptable. Deadline: Friday February 23rd, 2018 Check with Bowdoin’s Career Planning office to inquire about Internship Funding. How you will be chosen: Applicants will be selected based on a combination of coursework, references, resume, cover letter and a potential phone interview. *Education Workgroup: Gleaning with Portland Arts & Technology High School (PATHS) at Jordan’s Farm, Oct. 12. 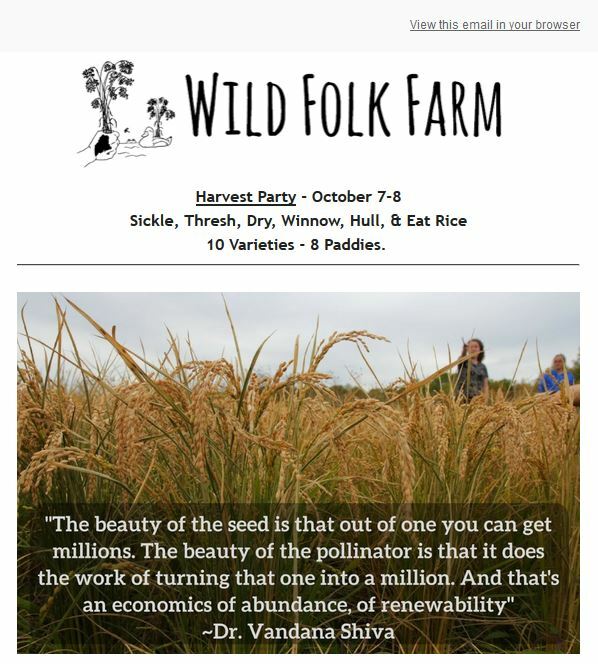 *Policy Workgroup: Gleaning with NRCM Rising at Wolfe’s Neck Farm, Oct. 14. *Events Workgroup: Wasted: The Story of Food Waste Screening, Oct. 16. At Portland Public Library. The Food Recovery Coalition (FRC) seeks to identify and implement efficient, systematic, and scalable means of reducing food waste and expanding access to healthy local food. Coalition efforts span networking and collaboration, data collection and dissemination, and educational events and advocacy. FRC has met regularly since last year’s event and is now contributing staff time and other resources to help organize Maine Gleaning Week events in Cumberland County. For more information or to join the group, contact foodrecoverymaine@gmail.com. The rice is almost ready. Human Power is what drives this operation and it means so much to have help during the harvest. We have topped 40 guests at each work party. Sure we could be using a combine, but we like parties more! We will also be testing out our new rice huller, custom built in Maine. This warm September is helping the rice maturation catch up from a cool June and we hope to have the best harvest yet! Last year we sold and shared over 1000 pounds of rice seed across the globe, as well as 1500 pounds as food across the state. The 4th rice party will be a weekend format. Family, Friends and Pets Welcome. 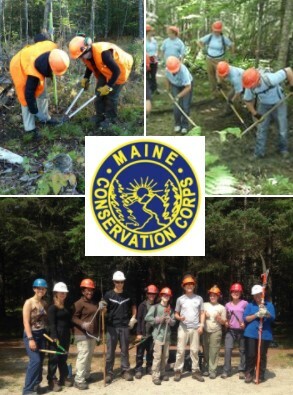 The Maine Conservation Corps is looking for Volunteers! MCC welcomes volunteers to join our AmeriCorps National Service Members and Teams on projects throughout the state. Individuals and groups are invited to help with projects like trail construction & maintenance, watershed surveys, invasive species removal, and many other conservation efforts. No prior trail work experience or minimum time commitment is required. Safety equipment is required and any necessary safety equipment and training is provided by MCC. Volunteers receive discounts on name-brand outdoor gear, among other benefits. Everyone is welcome! Current volunteer opportunities are posted on our webpage! For more information email MConsCorps.VOC@maine.gov or call (207) 624-6092.